Director Michael Patrick Albano brought out all the clichés and stereotypes in the characters, including the animals, which gave humour to the production. ‘Paul Bunyan’ is Benjamin Britten’s first attempt at opera, written in 1940 while he was living in the U.S., five years before his first major success Peter Grimes. Paul Bunyan was intended for a Broadway run, and indeed contains many elements of a Rogers & Hammerstein show. The music contains elements of American folk, blues, with large choruses. The show failed miserably however, and played for only one week at Columbia University, before Britten put it away. Toward the end of his life, he made some revisions. Since then, it has been performed occasionally, particularly in 2012, the 100th anniversary of Britten’s birth. The operetta is a light-hearted enactment of the building of America, within the confines of a lumberjack shanty of the mythical Paul Bunyan, an off-stage voice throughout the performance. It opens with geese and trees, both young and old, talking about impending change coming to the virgin forests. Characters or perhaps ‘caricatures’ arrive from various parts of Europe ready to clear the land. Despite their ineptitudes and squabbles, they go on with Paul’s help to become the farmers, businessmen, and politicians that will make America great. The plot is moved forward with the help of a balladeer who appears three times throughout the work. Last night’s production worked to overcome the obvious weaknesses in plot lines and two-dimensional characters with often-forced humour. Dann Mitton was effective in his role as narrator and pulled off his folk ballads convincingly. Brittany Cann’s lyrical soprano voice provided some beautiful and tender moments. Adam Harris was particularly effective as the Western Union Boy bringing physicality, comedic timing and a distinctive voice to the role. Many of the other characters were individually well-suited, but together, were unable to make up for the lack of substance in their roles. 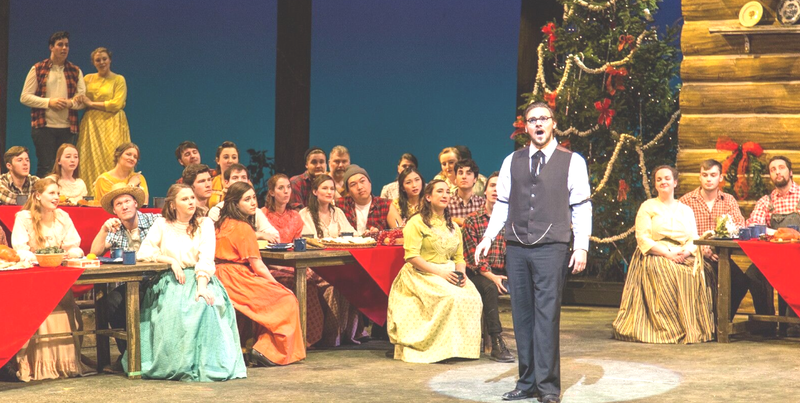 U of T’s Opera Division has always prided itself on choosing repertoire without resorting to the commercially successful operatic standards. This operetta was a good choice because of Benjamin Britten’s masterful choral writing and the many roles accessible to student performers. Nevertheless, in 2016 the work is dated and needs more substance of story and character to work as a successful piece of entertainment.